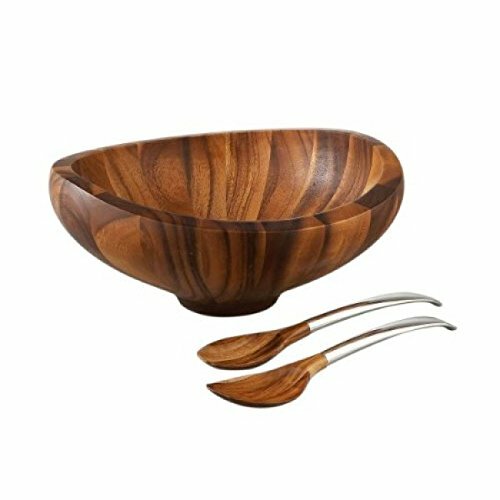 The Butterfly Salad Bowl with Servers marries rich acacia wood and lustrous alloy for a look that is both elemental and modern. With sweeping upward lines and a scooped interior, the piece is ideal for people who love to entertain. Perfect for dinner party salads, the deep color of the acacia wood contrasts perfectly with bright greens and colors throughout your salad. Your guests will eat first with their eyes promising a hit with any salad you create. Sean is an award winning designer, sculptor and furniture maker. His sensuous forms are meticulously shaped by hand, illustrating his sculptural approach to developing his designs and underlining his mastery of numerous materials. His keen aesthetic, sensibility, and understanding of form make his handmade designs as appealing to the eye as they are to the touch. Recognized for its award-winning designs for more than 60 years, Nambes commitment to timeless beauty, artistic integrity and uncompromising quality is evident in the brands collection of serve ware, barware, home dcor and gift items. Nambe collaborates with the worlds most esteemed designers to develop products that bring function and style into the home. Package contains (1) Nambe Butterfly Salad Bowl with Servers. Made of Acacia wood and Namb Alloy. Bowl: 16" D X 6.75" H; 4 QT. Servers: 14" L. Hand wash; dry immediately. Pair with Butterfly Individual Salad Bowls. Designed by Sean O'Hara in 2008. MAKE A STATEMENT: The Butterfly Salad Bowl with Servers marries rich acacia wood and lustrous alloy for a look that is both elemental and modern. With sweeping upward lines and a scooped interior, the piece is ideal for people who love to entertain. BE A CROWD PLEASER: Perfect for dinner party salads, the deep color of the acacia wood contrasts perfectly with bright greens and colors throughout your salad. Your guests will eat first with their eyes promising a hit with any salad you create. DESIGNER SEAN O'HARA: Sean is an award winning designer, sculptor and furniture maker. His sensuous forms are meticulously shaped by hand, illustrating his sculptural approach to developing his designs and underlining his mastery of numerous materials. His keen aesthetic, sensibility, and understanding of form make his handmade designs as appealing to the eye as they are to the touch. MUSEUM QUALITY DESIGN: Recognized for its award-winning designs for more than 60 years, Nambe's commitment to timeless beauty, artistic integrity and uncompromising quality is evident in the brand's collection of serve ware, barware, home décor and gift items. Nambe collaborates with the world's most esteemed designers to develop products that bring function and style into the home. PRODUCT SPECIFICATIONS: Package contains (1) Nambe Butterfly Salad Bowl with Servers. Made of Acacia wood and Nambé Alloy. Bowl: 16" D X 6.75" H; 4 QT. Servers: 14" L. Hand wash; dry immediately. Pair with Butterfly Individual Salad Bowls. Designed by Sean O'Hara in 2008.